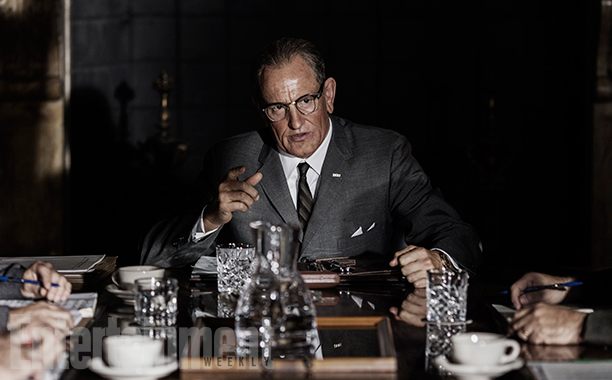 More Toronto Film Festival action as Rob Reiner’s LBJ has screened. The biopic of our 36th President casts Woody Harrelson in the title role with Jennifer Jason Leigh as Lady Bird. Other cast members include Richard Jenkins, Bill Pullman, and Jeffrey Donovan as JFK. The pic has yet to secure to a fall 2016 release date, but it will likely get some sort of qualifying awards run before year’s end. It will probably come up fruitless. LBJ has received decent reviews, but they don’t suggest it will be any sort of player in Picture or Director. Any Oscar chatter for this political drama was more geared toward the performances. Early reviews have suggested Harrelson does a commendable job in the role, even if more than one critic has pointed out a total lack of physical resemblance. Leigh was nominated last year for Quentin Tarantino’s The Hateful Eight and a consecutive nod seems doubtful. Where LBJ could suffer most in the minds of voters is that it could be looked at as the second best film this year about the man. HBO’s All the Way with Bryan Cranston earned plenty of Emmy nominations. The big screen version of LBJ faces an improbable road to do the same. This entry was posted in Oscar Predictions and tagged academy awards, All the Way, Bill Pullman, Bryan Cranston, Jeffrey Donovan, Jennifer Jason Leigh, LBJ, movies, Oscar Predictions, oscars, Quentin Tarantino, Richard Jenkins, Rob Reiner, The Hateful Eight, Toronto Film Festival, Woody Harrelson by toddmthatcher. Bookmark the permalink.